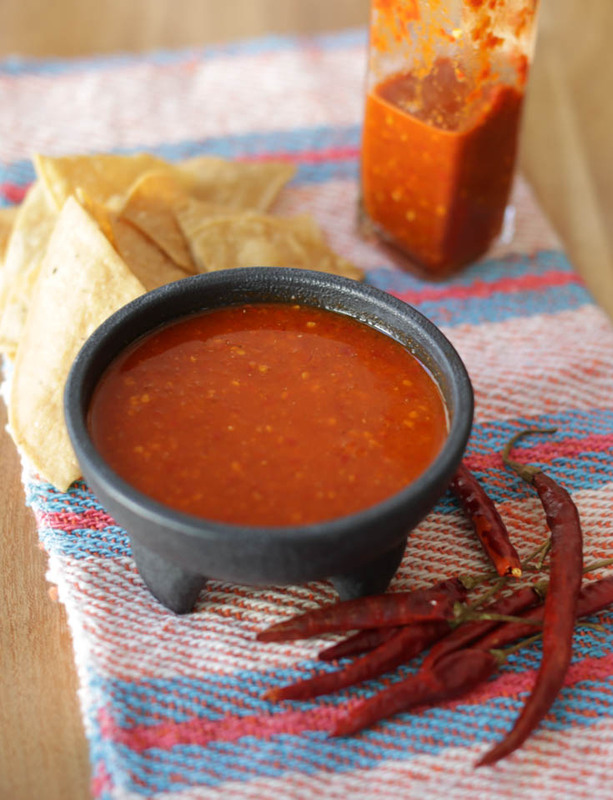 I’ve been working on this chile de arbol salsa (what we call “hot sauce” in the US) for at least five years. My first serious notes about it are dated summer of 2012, but I’d been trying out variations before then. 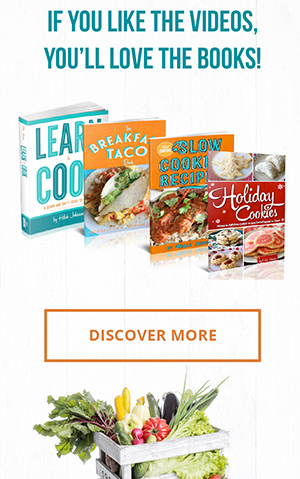 You may not know, when we started this cooking show and website in 2010, I had a full-time job as a dental assistant. There was a woman who’d come by the office about every two weeks right around lunch time carrying a cooler filled with hot tamales, wrapped up by the dozen. God, they were perfect. I’d get the vegetarian (except for the lard, I’m sure!) tamales de rajas; they had a white cheese and strips of roasted jalapeño inside. Each dozen came with a tiny baggie of a smooth, runny, pure red salsa that was SO hot and SO delicious I could never stop eating it. I’d always run out before I finished my tamales. I asked her once what was in it and she just said chile de arbol and salt. I suspect there was more to it than that, but I do not blame her for keeping it secret. Here’s my version of chile de arbol salsa. Try it on tamales, fried tacos, breakfast tacos, even pizza. Pretty much rules on everything. 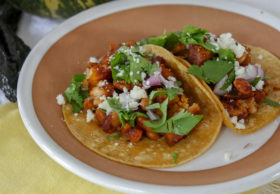 Click here for more info on the Homestyle Mexican Cooking Course with Carlos! Remove stems from chiles and discard. Cover chiles and peeled garlic cloves with boiling water. Cover and let soak 3 hours or longer. Drain and add to blender with remaining ingredients. Blend until smooth. Taste to see if you’d like more salt. Pour into a jar and cover loosely. Allow to age in a dark cabinet for a week, maybe longer. It might bubble a little so we want to wait for that to finish before pouring into salsa jars. Transfer to smaller jars and seal. Keeps at room temperature for 6 months. Actually, whether or not salsa outsells ketchup depends on how you measure sales. 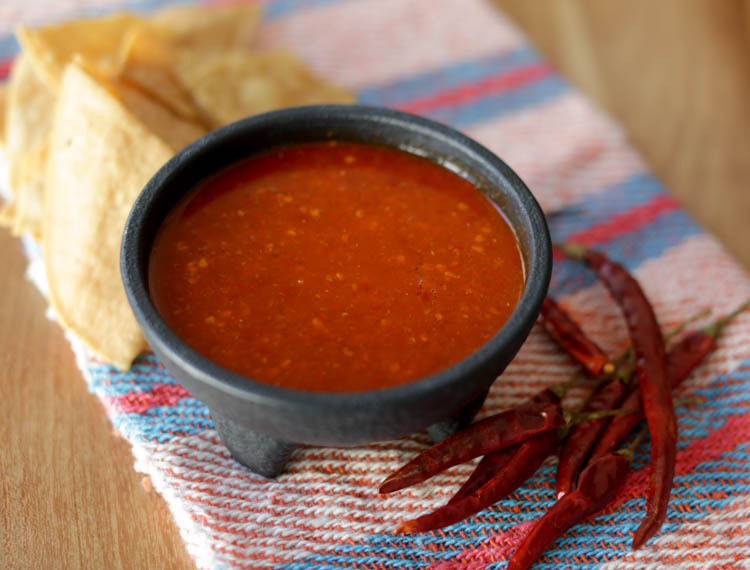 If measured by sales in terms of dollars, salsa wins because it costs more per bottle than ketchup. But if measured by units sold, ketchup is still numero uno. Of course, I read this in a book called “Ketchup” (the history of ketchup is a lot more interesting than you might think). Any tips on sterilizing the jars and the bottles? Great question. I just run them through the dishwasher first for this salsa recipe. I’ve never had a batch get contaminated – might be the vinegar but I suspect the high volume of capsaicin retards bacterial growth, too. Hey Hilah! I’m not too experienced in aging or canning, but I’m wondering, what makes this salsa safe to stay outside refrigeration for a week or so? Is it the vinegar? Hey Hilah, I was wondering if this will ferment in the fridge? I think Ive seen videos where kimchi is fermented in the fridge. Or does it have to be on the counter? Oh shoot, I think I used the wrong vinegar. I used filtered apple cider vinegar. Will it not ferment if it’s not the unfiltered kind? This is very close to a sauce from my all-time favorite Mexican joint. Before I left the area, the couple who owned it sat down with me to pass on some of the recipes for the items I… LOVED! I was a very faithful customer (maybe an addict)… and it was very sweet of them. 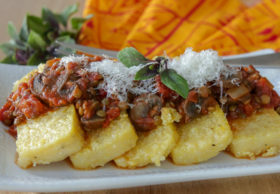 What they used as a table sauce is essentially this recipe with a few differences. It uses white vinegar instead of cider, and the chiles de arbol(no dang substitutions haha) are boiled/simmered for about 20 minutes in the broth water (cover/add a bit H2O extra for steam evap). I seed the chiles to whatever degree of heat I, or the lucky tasters, will want – most can only handle fully seeded. I allow to cool a bit, then in the blender I add 1Tb oregano and 1Tsp cumin, the salt and garlic, blend(seemingly forever) and strain. The straining is important to removing excess bitter bits and unwanted fibrous-ness imho. Add vinegar, then salt to taste. Bottle and let stand in fridge for as many days/weeks as you can keep yourself away from it, as it gets better with age over the weeks to come. Where are you from? I’m hoping it’s the same restaurant I enjoy…..
Just wondering as I have the plant on the balcony, can I do the salsa with fresh chillies or do they need to be dried? I made the recipe without vinegar as then it tastes exactly like our favorite sauce from Matador restaurant in Taylor Michigan. THANK YOU for this recipe. I usually have to go and fill up my own tupperware just so I can eat this delicious red sauce on EVERYTHING! This is hands down the closest recipe I have found that is close to the red salsa at the local Filibertos here in Arizona. I have tried so many different recipes and none have come close until today. I have not allowed it the time to sit for a week( I could eat it all today!) as I just finished the batch, but I can’t imagine it getting any better. Now I just need to find a recipe for the green salsa they have! 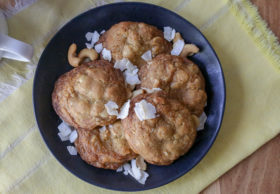 Hilah: Terrific recipe and I’ll be making my second batch today. I can tolerate heat, but being essentially all peppers this one is a bit much for chips. For dipping, I toast the chilies and puree with some tomatoes and possibly a tomatillo or two. And that’s hot! I use yours as a condiment more than anything. Try it in bean soup sometime. I spiked my BBQ sauce with it yesterday for our country ribs. Best of all the shelf life is a huge plus. It’s always on hand. Hilah: Made batch #2. Did a portion of it as Patrick suggested with the oregano and cumin. Very good. Only here’s the thing. It’s not hot!!!! (Just after I told you too hot for chips). Made it exactly as you wrote it. It has a little kick, and is still very good, but I can eat it straight by the spoonful. My first batch gave me hiccups if I tried even a little straight. Ever run into this? Gotta be the peppers. What do you think? is the really hot one or this later batch I’ve described the norm? That is definitely not the norm! I wonder if your chiles were mis-labeled? Definitely going to try this recipe. I got some advice at a Mexican restaurant to lightly brown the dry chiles before adding water. Adds a bit of smokiness to the flavor. Thanks for the recipe. That’s a great suggestion, Don! I’m 5 days into fermentation, hot sauce has become very thick, any ideas? Thanks. Is it thick even after you stir or shake it? Sometimes it gets a thicker bit at the top, like the first inch will get a little dry but once it’s mixed again, it’s a good consistency. 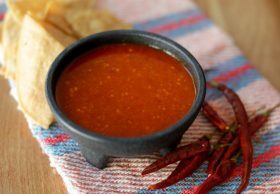 Could this salsa be made with Chile de Arbol powder instead of dried chile de arbols? If so, would I just use 3 oz of the powder or would I need more or less powder by some factor? I may just give it a try and see how it turns out although it would be nice to hear any suggestions on any weight conversion that should take place based on others experience substituting powdered chiles for dried chiles. I haven’t used ground chile de arbol but see no reason why it wouldn’t work fine. The weight would remain the same, but your sauce might want a little more water in the beginning. All of it was very thick, I had to add quite a bit of water and re-mix, turned out fine. How many dried chiles is in 3 ounces? 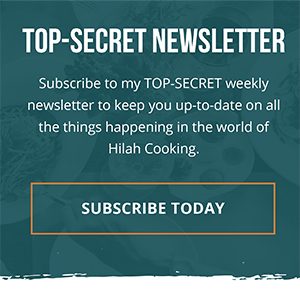 Hi Hilah! I enjoy your site and am getting ready to make this recipe exactly as written. For the 2nd batch, I intend to pan roast the dried chiles a bit to add a touch of smokiness. That was per a suggestion from a local taqueria. Thanks again. So, what can I do to make it maybe less spicy?? Not much of a cook here.. but it looks fabulous! Hi Hilah! So do you add the 2 cups of water with the drained chiles/ garic, vinegar, and salt into the blender? Approximately how many chiles are in 3 oz? Also, you use dried chile de arbol right? I used to love those little cups… they came with my california burritos! I spent 2 years on San Diego and the food was glorious… wanting to replicate this flavor is what brought me here. ok my lovely. Its time for me to finally get those chilis you brought overseas to me to work. i am sick (and tired) of not finding a decent taco sauce, so thats it. time to make this recipe! how do you think it will work using the California chilis? basically, it will work with any dried chili? thanks Trix. Hello dear! It should work with any dried chili, I think. Maybe a mix of arbor and guajillo or ancho would be nice – a little less spicy but full flavored, I’m sure. I just made this sauce and am waiting for it to bubble and stop. So far no activity. Should I continue to wait or nah? The temp around is very low btw. It’s cold weather outside. It’s okay if it doesn’t bubble. You’re right, it might be too cool to ferment. It’s still good! I am not sure if it was asked yet, this conversation has been going on for YEARS! LOL.. which is awesome. it is now sitting in a dark corner… again. I feel bad, like it’s in timeout or something. If this ends up being TOO hot, I may go down to one handful (exact measurements.. I know…) with 4 guajillos, and 4 cloves of garlic. Can I now age this in the fridge or should it sit at room temp? Did you strain out the peppers flesh parts before bottling? or are all the debris still in there? Hey Joshua! Your salsa variation sounds great! You could refrigerate it now if you like. Otherwise it’ll be fine at least a month at room temperature in a jar. It lasts much longer, but I find that the flavor is best the first month. I don’t bother straining my salsa, rather preferring to blend it until it’s almost smooth. But you can strain it if you like! Thank you for getting back so quickly. I searched high and low (mostly just sideways actually… linearly across the internet) to find out what peppers were even used so many years ago in San Diego… and all signs pointed to arbol. Then I found a local mexican hole in the wall convenience mart that had arbols and guajillo peppers by the huge back full (1lb of peppers is a big bag)… and then I found probably 5 solid arbol hot sauce recipes… but two were very close (yours and one other, the only difference being simmering for 30 minutes, or adding boiled water and letting them sit for hours)… but the comments raved about the flavor… but the one comment that let me know i was in the right place was your reader above telling her story of small little cups of salsa from the mom and pop taco shops of california. Thank you again. I’ll let you know how it turns out. I believe I’m going to let it sit in my dark corner until Friday night. Pop in the fridge before I go to bed and then enjoy over some farm fresh scrambled eggs on Saturday morning. I’ll come back here to tell you my thoughts. Will this ferment in the fridge?? BTW I made this and just had a taste with some crackers and whoa nelly!! replicate the house made salsa/sauce but to no avail. That is, until now. It will not ferment int he fridge,e but it will mellow out. Meaning, it will still be quite hot, but the flavors coalesce. Super glad you have found this salsa, too!